Joseph’s brothers stand humiliated before him. What has brought him to deny his own flesh and blood when they arrive before him in submission, begging for food? Is the feeling of revenge stronger than his yearning for reconciliation? The larger-than-life figure of the bird, which I often employ as my alter ego, serves as a sort of punishing agent. Here the bird symbolizes the soul-searching of the protagonists, yet also shields them with her overriding wing. Through the process of catharsis, Joseph is freed from the deeply hidden trauma of his painful past and allows himself to be reunited with his brothers. Professional Background Michal Vizer, z”l [1943-2014], worked primarily in printmaking including etching, linocuts, and mixed media on paper with a preference for monochromatic works. Vizer’s work has been featured in numerous group and solo exhibitions in Israel and abroad. 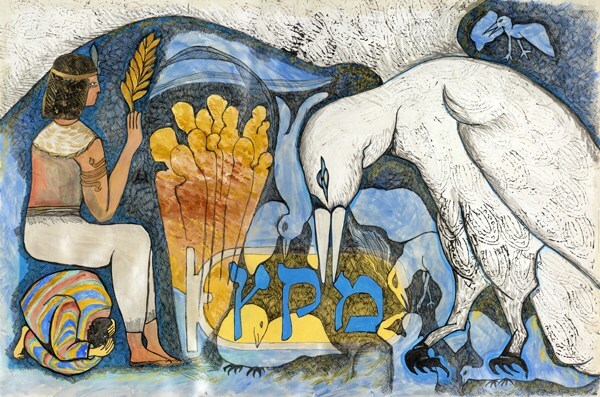 She was a member of the Professional Visual Artists of Israel and the Israel Designer Craftsmen’s Associations.